Unique Culinary Adventures presents a perspective from Baltimore, Maryland relating what is new, unusual, undiscovered, overlooked or forgotten regarding food and drink. Mrs. Yi has come up with a winner that neither of us had expected. Its inspiration was a relatively mundane recipe that she found in an old and obscure cookbook. The changes that Mrs. Yi made to that recipe to create this one were subtle and casual, but profound. 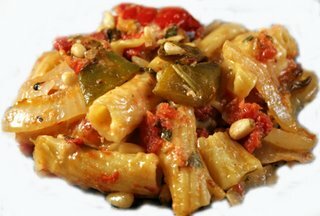 Except for having enjoyed it myself, I would not have believed that a vegetarian Italian country pasta dish that traces its origins to Tuscany could please me anywhere near this much. If you like the kind of southern "Italian" food that's become an American staple, this truly Italian dish could raise your sensibilities to a new level. Anyone into comfort food should love it, as should anyone who's into the slow food movement. The cookbook that got Mrs. Yi started was Cooking from an Italian Garden by Paola Scaravelli and Jon Cohen, Henry Holt & Co., New York, 1985, specifically the recipe therein: "Pasta Gratinata con Peperoni," or Baked Peppers and Pasta. * To peel peppers, place in broiler, turning, until charred. Remove, place peppers in a bowl and cover until cool, then peel skin off with your fingers. Heat the oil in a large frying pan or low-sided saucepan, add the onion, and saute over medium heat until transparent. Add the pepper strips, tomatoes, one half cup of the reserved juice, parsley, garlic, salt and pepper. Mix well and continue cooking, partly covered, stirring occasionally, for five minutes. Remove cover entirely and continue cooking another ten minutes or until excess liquid is evaporated, peppers are cooked but still firm, and sauce is dense but far from beginning to dry out. Preheat oven to 350 degrees Fahrenheit. Then butter a 9 inch square baking dish approximately 3 inches deep. Bring 4 quarts of salted water to a rapid boil, add the pasta, and cook for approximately nine minutes or until pasta is almost al dente, but still undercooked. Drain thoroughly, add butter, 1/4 cup of Parmesan/Romano, and a pinch of nutmeg. Place half the pasta in the bottom of the prepared baking dish and pat down with a wooden spoon. Spread half the Gruyere over the pasta, and spread half the pepper-tomato mixture on top. Repeat the layering with the remaining ingredients, ending with the pepper-tomato mixture. Combine 2 tablespoons of Parmesan/Romano with the egg white and spread it evenly over the top. Bake in the preheated oven for 15 minutes, sprinkle with the pine nuts, and then bake for another 15 to 25 minutes, until the top begins to brown. Allow to rest for 5 minutes, then serve in the baking dish. 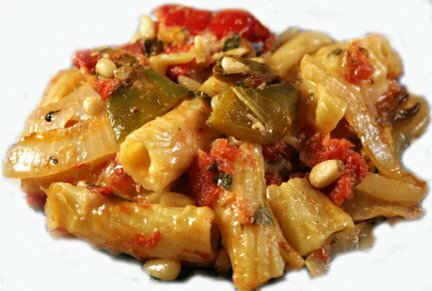 Southern Italian Comfort Food at it's Best! I've never "peeled" a pepper. I did them on the Weber gas grill and they competed with college football. The result being way over cooked as they were very soft before they even hit the sauté pan. The only damage done was of a texture nature because the flavors of the cheese, onion, peppers, tomatoes blended perfectly. This dish just burst with flavor. I have a few suspicions as to why it did. That being said, I feel strongly this dish would not taste the same if corners were cut, by using only green peppers. The sweet Vidalia onion is also a must and I also used the combination of Parmesan/Romano cheese, which I feel is the better choice as opposed to only using Parmesan. I made this dish for myself on Saturday and it almost didn't make it to Sunday, it was so good. A little more concentration during preparation and it could be served to guests.